Form and function merge comfortably to give rise to contemporary pioneering appliances for our comforts. No more waiting for the commercial breaks to get your snacks! LG may have had some TV- fridge combos in the past, but the LSC27990TT will have you staring at it for long. 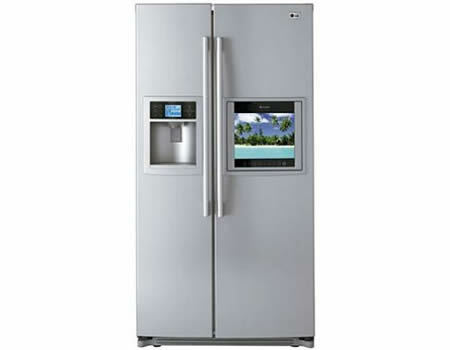 The hottest addition to the company’s great range of refrigerators is side-by-side icebox with digital high-def built-in. It contains a 15-inch HD LCD, FM radio, DVD connection on top and a 4-inch weather & info center LCD apart from a recipe bank, a calendar, child lock functions, a digital photo album as well as a “CustomCube” ice maker! Phew…..all in it! This visual-treat refrigerator won’t be available until next year and doesn’t come cheap too; the LSC27990TT will run $3,600.